Emerald Coast Bait and Tackle is a small bait & tackle shop owned & operated by local fishermen. Our two owners were competitors in the charter industry that came together to supply the local fisherman with all their fishing needs. We have a combined 30+ years of knowledge to answer all your fishing questions whether it be inshore or offshore. Emerald Coast Bait and Tackle will also have a charter fisherman in-house to offer advice to customers about fishing in the Gulf. In addition to standard bait, the shop offers fly-fishing gear and live bait such as shrimp and eels. Whether you’re a recreational fishermen who just does it on the weekends or charter boats that fish 180 days straight, we have what you need. Spring Break is upon us! With our weather being rather bipolar we are still managing to find the fish. The main species we are catching consistently have been Redfish and Black Drum. The Redfish have all been larger Bull Reds, which are an incredible fight on light tackle. The Sheephead bite has been hit or miss but will hopefully pick up as the temperature begins to rise. March also means the Spanish mackerel are not too far from making their appearance. Spanish Mackerel are caught by trolling and are also a fun fight on light tackle. Most people think of Spring Break attire as a pair of flip flops and shorts well you may considering bringing some layers. The weather has been very up and down this year so far. Just this past week we had highs in the 80s while this week we are seeing lows in the 30s. We hope to stress to our anglers that it is a great idea to layer up especially the early morning and late afternoon trips. The temperature will be a few degrees colder out on the water so pack a jacket or two, long pants, and closed toed shoes such as sneakers or boots. Fishing in the calm backwaters here in Destin, Florida is super relaxing and you are guaranteed to have a great time. Most of our fishing is in the Choctawhatchee Bay and Intracoastal Waterways. While bay fishing in Destin, we mostly target redfish or speckled trout, but it’s not uncommon to also target Spanish mackerel, black drum, sheephead, or black snapper. We fish over grass beds, oyster bars, and around our favorite docks and bridges. We use the best ultra light tackle on the market from Shimano for reliable drag screaming action. We also sight fish for Bull Redfish during the spring! There is nothing quite like hooking a 30+ lb bull redfish and being face-to-face with such an incredible species. (These are all trophy fish and they are catch and release only!) They definitely make a picture worth a thousand words. Don’t forget to bring the kids. They are the future of our sport. If they get to go, they will learn to love the outdoors. Remember your camera, you never know what you might hook while fishing in Destin, Florida – The Luckiest Fishing Village in the world! Our latest Destin inshore bay catches have been Sheep Head, Redfish, Black Drum and a few Speckled Trout. Our weather down here in Florida has been up and down all winter. The warmer days have been a better bite versus the days when a front comes through. Colder days cause for a little more patience as the fish are slower to react to a bait. Our go to live bait has been shrimp or bull minnows. This time of the year, artificial lures have been successful as well. With the fish moving slower due to cooler water temps, it is important to remember to work your lures slower as well. Another method we pay close attention to especially this time of the year, is birds working. While the birds are diving on top, the big bull redfish will be lurking underneath and are the main cause of the baits being pushed to the surface. The Sheephead and Black Drum we have been catching can be found around older docks and bridges that have quite a bit of growth on them as the fish feed on the oyster shells that have developed there. You can even bring a shovel along with you and scrape the pilings to chum up the water before tossing a bait in. *These trusted partners are located thorough the Emerald Coast including Fort Walton Beach, Destin, San Destin, 30A, Santa Rosa Beach and Miramar Beach. Check back with us next month for more tips and fishing reports. Happy New Year, see y’all on the water! The famous “Crab Island” is quite the site to see as you drive over the Destin Bridge that connects Okaloosa Island to Destin, Florida. Getting out and experiencing the floating barge and boat party is a must when you come to visit! Crab Island is a submerged island that is fun for the whole family! With the water being anywhere from one to four feet deep, boaters are able to anchor-up and relax in the sun and crystal clear water! HOW DO I GET TO CRAB ISLAND? Crab Island is completely surrounded by water and you will have to get there by boat, kayak, paddleboard or any other type of water transportation. There are multiple rental companies in the area that offer rental pontoon boats, jet skis, and other water toys that can get you to crab island. If you are inexperienced on watercrafts and boats, then do not worry! We offer private crab island cruises that come complete with a hired licensed captain. Our Captains will do all the navigating you just handle the relaxation part! Our private crab island cruises are the easiest and safest way to travel to and from Crab Island. During the summertime with all the hectic boat traffic and large amounts of people, navigating can be overwhelming. We will supply the boat, ice, and licensed captain. You just bring any floats, food/drink, and beach attire you would like while out on Crab Island. Crab Island is a floating party! This party is family friendly! From blow-up water parks, jungle slides and trampolines, floating restaurants and live music from the DJ booth, there is something for the whole family! DO I HAVE TO PAY TO PARK? Another benefit to spending a day on Crab Island, is it is FREE. There is absolute no charge to park your boat or water toy out on Crab Island and you are welcome to stay out there as long as you want. Some boats even moor over night! There is nothing like watching the sunset while out on Crab Island. Voted Best Guided Fishing Company on the Emerald Coast! We offer fully guided inshore fishing trips that include all the licenses, tackle, bait, ice and fish cleaning. Destin Inshore Charters is your premier Destin Inshore Fishing Guide for the whole Emerald Coast. Not staying specifically in Destin? That’s ok!! We are centrally located to accommodate all surrounding sister cities that border Destin city limits. We are no longer then a 15 to 20 minute drive or shorter from Navarre Beach, Fort Walton Beach, San Destin, 30a, Grayton Beach, and Seaside. 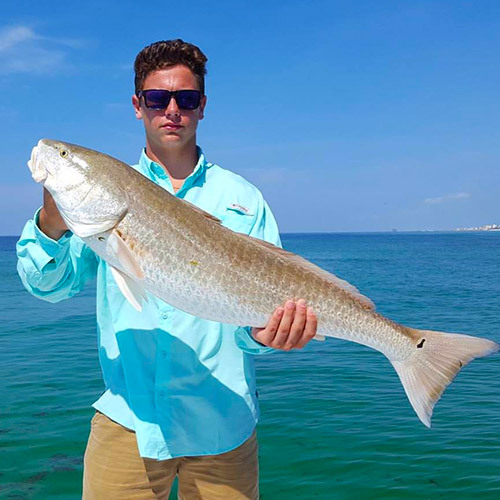 Whether you are looking to inshore fish in Seaside, Florida or trying to find a guided fishing trip on 30a, Destin Inshore Charters have you covered. What can you expect while fishing Inshore in the Bay? Our most popular trip for the Inshore Bay Fishing is our four or six hour half day trip. Four hours is a great start trip to hit our most popular docks and bridges. Six hours is a sufficient amount of time to fish a majority of our Choctawhatchee Bay. Our trips will consist mostly of fishing around docks and bridges in the deep holes but it isn’t uncommon to also fish out near the jetties which are large man made rock structures leading into the gulf or to drift across a grass flat with a popping cork. While live bait is preferred, we also use ‘artificials’ occasionally, depending on the fish’s request that week. Red Fish, Speckled Trout and Black Drum are our main targeted species while Black Snappers are often caught among these as well. Destin Inshore Charters uses only the top of the line Shimano light tackle reels and rods to make sure you are set up to catch your fish of a lifetime. It just doesn’t get much better then catching a 30lb Redfish on 10lb test! Our boats and equipment can accommodate the most advanced angler to the first timer. Kids are welcome on all of our trips and we highly recommend you bring them along! They are the future of our sport and there is nothing like seeing a child light up after catching a fish. Be sure to check out our “Kids Fishing Trips” as well. With Spring Break coming to an end and summertime right around the corner, we are gearing up for the warmer water and hot fish bite. The Sheephead bite has slowed down and the Pompano fishing is currently in full swing. Destin Inshore Charters has also been catching Redfish, Black Drum and a few Speckled Trout. Our best bet for catching fish has been using live shrimp or live sand fleas. As the water continues to heat up, it shouldn’t be long before the live Greenies and Porgies start to show up. Once these show up, the captains will catch fresh bait each morning in their cast nets. Redfish and Speckled Trout usually won’t eat anything else once the Greenies and Porgies start to show up. Fresh live bait is very important in our Inshore eco system. The wrong bait can set up for a slow fishing day. Fishing in the calm backwaters here on the Emerald Coast in Destin, Florida is super relaxing and you are guaranteed to have a great time. Most of our inshore fishing charters is in the Choctawhatchee Bay and Intracoastal Waterways. While inshore fishing in Destin, Florida we mostly target redfish or speckled trout, but it’s not uncommon to also target Spanish mackerel, black drum, sheephead, or black snapper. We fish over grass beds, oyster bars, and around our favorite docks and bridges. We use the best ultra light tackle on the market for reliable drag screaming action. We also sight fish for Bull Redfish during the spring! There is nothing quite like hooking a 30+ lb bull redfish and being face-to-face with such an incredible species. (These are all trophy fish and they are catch and release only!) They definitely make a picture worth a thousand words. Don’t forget to bring the kids. They are the future of our sport. If they get to go, they will learn to love the outdoors, inshore fishing charters. Remember your camera, you never know what you might hook while fishing in Destin, Florida – The Luckiest Charter Boat Fishing Village in the world! That is correct. Red Snapper season has been extended and is now the longest it has been extended since 2013. The U.S. Department of Commerce announced an expanded 39 day recreational Red Snapper season for private private anglers fishing in Gulf federal waters. The season will start Friday, June 16, and go through till Monday, September 4th. Only on Fridays, Saturdays, and Sundays. Also included will be Monday and Tuesday July 3 and 4, and Monday, September 4. Keep in mind that there are certain guidelines that you have to follow when fishing Red Snapper. The min. size limit is 16″ TL. The reason that this is the size limit is because one 24-inch female Red Snapper can produce as many eggs as 212 17-inch female Red Snapper. So the more larger and older Red snapper we have out in the wild, the more Red Snapper we can catch and maximize the number of younger fish coming into the fishery. This is really great news being able to fish more than just the 3 days of June 1-3. We can now fish every weekend up to September 4 and take advantage of this great opportunity. There is a limit to how many you can catch a day but this means that you can fish for more Red Snapper over a span of a few months! Let’s get out there and catch Red Snapper.